Single component, universal adhesive, which is hydrophilic and suitable for use on moist dentin (wet bonding technique). Thousands sold without any complaints. Made in USA. Silmet ProLink universal adhesive is a single step bonding agent that delivers outstanding shear bonding values to dentin, enamel & all popular light, dual or auto-cure composites. 5ml bottle. Compare to Clearfil SE Bond. Versatile bonding system for use on dentin, cut or uncut enamel. Water and nano-filled ethanol formulation allows for use in a wet or dry field. Prelude One is a light-curable single component self-etch adhesive designed to bond composite resins to most dental surfaces. Compatible with dual and self-cure composites without the use of an additional activator. Ultimate Bond premium bonding agent. Single component light cure adhesive. Minimizes microleakage. Reduces secondary caries. 7ml bottle. Made in USA. Pac Bond. One step bonding system. Light cure. Works well on both enamel & dentin. Fast set time. Very high bond strength. Amalgambond Plus adhesive system. Kit, activator, tooth shade powder, clear powder, universal catalyst, and base. Brush & Bond. 4-META based composite bonding agent. Contains brush and bond liquid (3ml) plus 100 activator microbrushes. One coat application. Dentastic adhesive system. Dual cure. The adhesive primer and resin bonding agent are separate components. Primer A (dentin/enamel initiator) Primer B (universal base). 6ml bottles. Dentastic UNO is an exceptionally strong, single-component adhesive for bonding to dentin, enamel, porcelain, metal, composite and other resins. 6ml bottle. Silane Bond enhancer. Single component material that enhances bonding values when applied to porcelain after etching. Kit includes 4- 1.2ml syringes and 8 dropper tips. 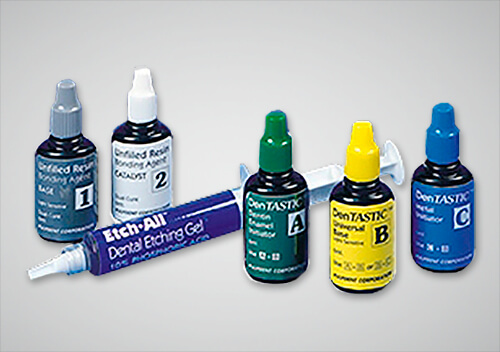 Stae is a fluoride releasing single component dentin/enamel total etch adhesive system, designed for direct bonding. Stae combines both primer and adhesive in one bottle to simplify the technique and decrease patient chair time. Light-cure adhesive resin system designed to bond to enamel and dentin. Indicated for restoration of teeth with direct composite resin, compomers or resin-modified glass ionomers. 5ml bottle + brushes. Shofu BeautiBond. Single component, light-cure, self-etch, 7th generation adhesive. Contains no HEMA. 30-second application.